Americans have the worst case of #firstworldproblems in history. Prosperity has spread so far and wide that we now have time to waste of frivolities like safe spaces, microaggressions and chasing phantom wrongs. Our successful are wildly successful, America is still a place where a person can be stone cold broke today and bathed in wealth next year, simply because they had a better idea. Absolute poverty does not exist and the relative poverty that remains means that our poor have things the lower middle class in Europe do not. As we provided a life of relative leisure for our families complete with vacations, toys, sports, after-school enrichment classes and sports, America was growing generations of young people who simply expected things because they never had to work to attain them. They were convinced that not having an iPhone 7 within 24 hours of Apple releasing them was equivalent to the depravation seen while growing up during the Great Depression. America succumbed to the “every child should go to college whether they can cut it or not” idea, only to have those institutions of “higher learning” cast out their students upon the land to discover all the reasons why we don’t deserve to harvest the fruits of the most successful country in the history of the world – and why those people who do should feel guilty about doing so. Marxism is based on the idea of a revolution that deposes the oppressive bourgeoisie and frees the proletariat from their chains but it is a fact that revolution can have no genesis among a contented people. Therefore, as any good Marxist knows, revolutions can be created. All it takes is to convince a contented people that 1) they are merely being fooled into their contentment and their liberty is merely an illusion, 2) their feeling of contentment is illegitimate because those feelings are based on some evil their forefathers committed in service to greedy capitalism and 3) taking pride that America achieved the role as the world’s only super-power is somehow illegitimate. Rather than taking pride in what we have accomplished (and continue to accomplish) as a country, Americans have now been convinced to go on a quest for the Marxist Holy Grail and to do that, the Marxists among us seek to sow strife and discontent when there is little real reason for it. Americans are told they must openly accept illegal immigrants and treat them humanely by countries that do neither. They are told that they are not doing enough for the poor and aged when fully two thirds of the federal spending go to support welfare and entitlements. They are told welfare is not sufficient event though a credible study by the Cato Institute discovered that welfare benefits in 13 states are the equivalent of a job paying at least $15 an hour and in 35 of 50 states, it is more financially viable to take welfare than work in a minimum wage job. Americans are told that slavery is responsible for the economic situation of black Americans while other minorities who have escaped similar situations come to America and find success – as a group, Asians have a higher median family income than whites (by almost $18,000 a year) and people of Indian, Taiwanese, Filipino, Australian and Israeli heritage all earn more than Americans of European heritage. Even in the face of this information, Americans are told that white people are still responsible for the plight of, and owe reparations to, the black community due to an institution that was ended a century and a half ago. This is a primary reason the American political left has had such a visceral and violent reaction to the election of Donald Trump. Trump’s populism presented a view of America that is exactly opposite to the dystopian creation of the political left. Rather than a singular focus on what is wrong with America, there is now a sense that focusing on what is right and exploiting the things we do well is the best way to create prosperity for all. There are many reasons I disagree with the President – all on a policy basis – but where we agree is that taking pride in being American and showing a true love of our country is the best way to unify America. March 9, 2017 in Politics. Here’s a First world problem…..muslims murdering Westerners ! Don’t know if the picture will show up. 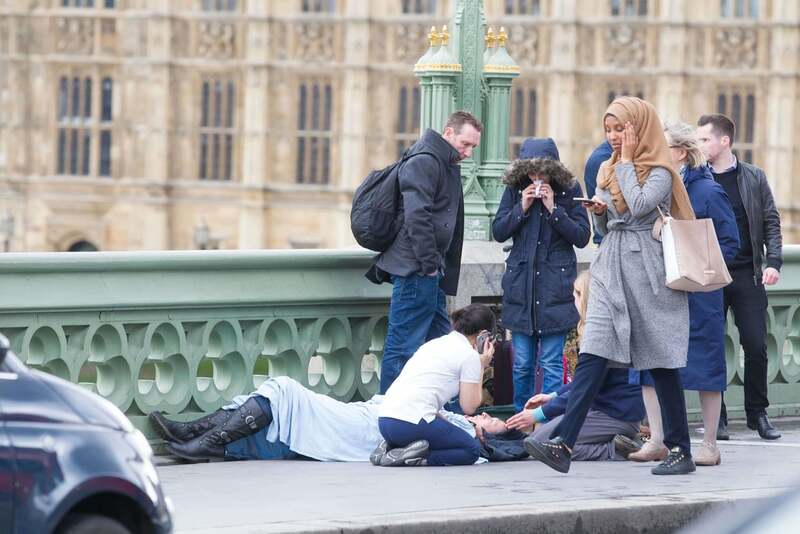 But it shows a muslim girl walking casually walking by a Briton killed or wounded today by another muslim. Of course other Europeans are helping while she walks by inches away ignoring the victim.